Chuck the steroids and hit the gym! Says Manoj Chopra, India’s first WWE champ, who was recently in town to attend a college function. His vast list of entertaining gigs include tearing a 1,000-page telephone directory, bending iron rods with his teeth and breaking police handcuffs - all in a jiffy! 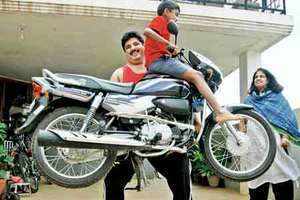 Meet Bangalore-based Manoj Sharma, who is six-and-a-half feet tall, weighs a whopping 152 kgs and is also the first Indian to participate in the World’s Strongest Man contest, held in Canada in 2004. In fact, he even made it to the training sessions of the World Wrestling Federation (now WWE) much before Great Khali did. Originally from Raipur, Manoj, who is popularly referred to as Chhattisgarh Giant and Bangalore Bhima, still continues to take the time-tested diet of kushti fighters of yore. “I’m a Punjabi. And in our days, kushti was sort of a family legacy. Special food cooked in desi ghee was a part of our diet. We used to eat every hour. Breakfast was 20 boiled egg whites and aloo paranthas. This was washed down with a homemade protein shake that had five litres of unadulterated fresh milk served with dollops of ghee and assorted nuts and dry fruits like almonds, cashews and raisins that were soaked overnight and ground to a fine paste. The rest of the day we had the regular dal-roti with five whole chicken and veggies,” says Manoj. This 43-year-old, who is currently touring the country to spread the anti-drug message, is a hit with the kids. “Every time I visit schools, children ask me a lot of questions like ‘Are you Khali’s brother?’ ‘Do you know Shaktiman?’ ‘Can you fly?’ ‘Would you be my dad?’ Their queries are endless,” he quips. Till date, Manoj has visited close to four lakh schools and more than 200 prisons, juvenile homes and detention centres, urging youngsters to keep away from bodybuilding drugs. Manoj says that it is the lucrative offers that lure young bodybuilders and wrestlers to try steroids and other drugs to gain instant fame. Talking about the outcome of drug usage, he says, “I’ve seen people in my career who have consumed drugs and won medals. But today, they live like a vegetable. They can hardly move around,” he says.